American poetry has performance issues. If you go to a lot of poetry readings, you know well the feeling I’m about to describe: you’re feeling good, beer and/ or notebook in hand, when a poet, acclaimed or with just a handful of poems in the world, takes the stage. As the poet approaches the mic, you brace yourself: this could go one of two ways. The poet’s voice could embrace you warmly, like that of a singer, or you could spend the next hour listening to a drone with a slight uptick at the end of each line. The poet could make conversational eye contact with the audience, as poets Naomi Shihab Nye, Forrest Gander, and Toi Derricotte do; or she could never look up from the podium. Why do some poets perform as though they had just come to in a bad dream? Sometimes, because they are amateurs, high school or new MFA students; but just as often, standoffishness about performance comes from experienced writers whose work glows on the page, but whose words just can’t seem to survive the trip from Garamond to the tip of the poet’s tongue. Okay, Harold. But it’s been almost thirty years since the first slam was organized in a working-class pub in Chicago, and since Miguel Algarín made poetry-out-loud one of the pillars of the Nuyorican Poets Café. Slam has now been part of the nation’s poetry vocabulary for long enough to deserve to move out of its parents’ basement and pay its own rent. It’s made publishing careers and recording contracts, and even Broadway stars. Saul Williams, arguably the biggest star of slam’s first generation, is now playing a Tupac Shakur-inspired character on Broadway in “Holler if Ya Hear Me.” The choice of Williams for the role draws a direct line between slam and rap, the closest the average American gets to poetry by turning on the radio. But perhaps most importantly, slam’s near-middle-age means that many young poets – including some now rising to poetry’s version of rock-star status – have grown up in it. Poets who cut their teeth on slam make up the ranks of some of America’s finest emerging and mid-career poets, and have won not only national slam accolades but hallmarks of success associated with poetry print culture: admission to top MFA programs, book publication from leading small presses, the Ruth Lilly Poetry Fellowship, the Whiting Award, and more. As these poets have developed a new kind of poetry career, where a packed performance tour can predate a first-book publication by years, the line Bloom so firmly drew in the sand has been eroding. Other, less hidebound critics have taken note: Dana Gioia, in his 2004 essay “Disappearing Ink: Poetry at the End of Print Culture,” saw that slam and spoken word were inspiring a new poetry audience, one that circumvented the academy and New York publishing houses. Susan Somers Willett, in The Cultural Politics of Slam Poetry, notes that slam has, since its inception, put critical power directly into the hands of the audience, making slam attendees feel that they, not the editors of book reviews, are cultural tastemakers and determiners of authenticity. As poets with performance backgrounds rise through the ranks of poetry print culture, American poetry appears caught between a fear of performance and a celebration of it. As these page + stage poets become more prominent in universities, journals, and reading series, are they helping to renew conversations about performance as an aspect of making poems? The thing about the page, as we’ve known since Gutenberg, is that it reaches more people, even if “more” is only a couple thousand. Or in the words of Aaron Samuels, himself a young poet who straddles the worlds of performance and print, “the great thing about print is that you don’t have to be there.” But despite that reach, poetry readings have been essential to building poets’ readerships since the fifties. To disdain them is to shoot yourself in the foot. Jamaal May, a Detroit poet with deep roots in the slam scene there, is among those who have started the campaign to make “page” poets better performers. Before the publication of his first book, Hum, he wrote a blog post for Poets & Writers called “On Giving a Not Terrible Reading.” “Writers tell me they don’t want to perform or be seen as performative,” he writes, but “I would argue that an overly dry, disengaged reading is in fact a performance. No one speaks that way.” With this criticism, May hit on the irony that underlies so many tepid readings by “page” poets: poets may fear that an engaged, even dramatic performance may come off as inauthentic; but as with wooden acting, not allowing the poem’s elements to guide a reading of it can seem far more false than reading with passion. Slam poets have typically not shied away from associations with the theatrical, maybe because slam is more likely to embrace genres, like persona, that lend themselves to character-building. Airea Matthews, a graduate of the Helen Zell Writers’ Program at the University of Michigan and a two-time finalist in the Women of the World poetry slam, is often drawn to persona in both her performance work and her work on the page. Persona and the drama it engenders on paper or on stage, she believes, is mostly about empathy, including “the grand acknowledgment of all you don’t and can’t know.” It’s hard to accuse performance with that sentiment at its core of being false. Susan Somers-Willett suggests that some poets’ fear of inauthenticity may stem in part from white poets and audiences seeing blackness as the most authentic expression of identity. Somers-Willett tracks white poets’ consumption and imitation of black art from minstrelsy to the Beats. These movements, she writes, provide a precedent for the audiences at poetry slams, who are predominantly white while the winners of major slam competitions are predominantly black. 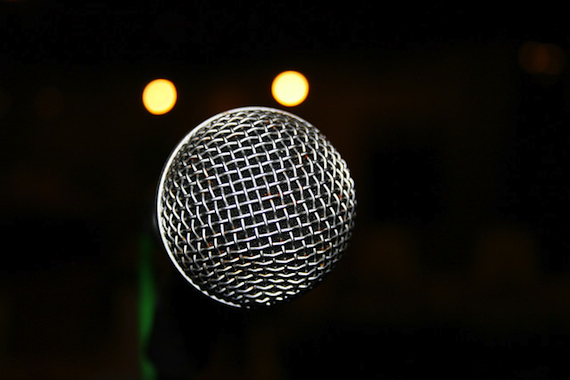 Because many slam poets deal directly with themes of social injustice, “…the slam may serve as a rare opportunity for liberal, white, middle-class audiences to legitimately support poets of color who critique white positions of privilege.” Poets who feel their privilege sharply may balk at the use of performance elements they associate with such critiques. Poets with May’s, Samuels’s, and Matthews’s backgrounds are positioning themselves as bridges between “the two cultures” of American poetry. But don’t call them “crossovers” – rather than leaving performance behind, they are helping to build a poetry audience that craves both excellence on the page and a vibrant performance behind the mic. “Page Meets Stage,” a Manhattan reading series run by slam poet Taylor Mali pairs Pulitzer Prize winners with National Slam champions. The series’ success suggests that the audience is there: slam and “literary” listeners alike want to celebrate, and even blend, both traditions, rather than rank one above the other. And poets comfortable with both are aware of the potential for groundbreaking work. While promoting Hum, Jamaal May made a poetry video of himself reading/reciting his poem “I Do Have a Seam.” The poem is a contrapuntal, which means it appears in two columns and can be read three ways: the first column alone, the second alone, or by connecting the two. In between the two columns, naturally, is a seam of space. The video opens with a shot of the left column, folded along its seam, black ink on white paper. Later, we see its right half, white ink on black. By lingering on the text, May calls attention to the form of the poem as it can only be seen on the page, with all three performance possibilities presented simultaneously to the reader. But he also makes his performance of the work essential, moving a hand across his mouth, closing his eyes. At one point, he quietly doubles his voice. What kind of poet does May want to be? Steeped in the familial community of Detroit slam, May is now finding the kind of success most poets in MFA programs dream of: university and writing conference fellowships, major literary prizes. But the video for “I Do Have a Seam,” tellingly, doesn’t choose sides. Instead, in keeping with many stage + page poets’ philosophies of composition, May’s work insists on being the thread that binds performance, with its potential for heightened sonic and dramatic effects, and the quieter, more visual work of the page. Is this inter-weaving of genres, this promising poetry Frankenstein, actually changing the way students and teachers approach poetry and its performance? The litmus test, as usual, is high school and undergraduate students. Keith Taylor, director of the undergraduate creative writing program at the University of Michigan, has watched both slam and “literary” poetry rise and fall in popularity. Once, he recalls, young poets talked of “Page vs. Stage,” clearly privileging “page” as the more serious. Now, he says, “it is clearly Stage AND Page. And some of them are making it clear that you can have your cake and eat it too… They are also imagining their poems as different things – poems for performance and poems for print. Two very different kinds of composition.” But fervent supporters of performance, Taylor says, can sometimes alienate the young writers who come to poetry more quietly and bookishly. If beginning writers start to perceive poetry as being only for performance, Taylor fears, this will scare off some great talent. But if we’re lucky, poets like May, Samuels, Matthews, and others will continue to help both slam communities and university writing programs occupy that middle space – that seam, that delicious gutter where poets use not just our voices or our hands, but all of our tools. When their work is done, I can’t say there will be no more terrible readings; but there might be a great many better ones. Leah Falk makes poems and texts for performance. Her poems and criticism appear in Kenyon Review, FIELD, Smartish Pace, and the Los Angeles Review of Books. A graduate of the Helen Zell Writers Program at the University of Michigan, she is a past recipient of the Beullah Rose Poetry Prize and a Pushcart Prize nominee. Her texts for music and dance have been performed in Indianapolis, Ann Arbor, and Vancouver. Born and raised in Pittsburgh, she lives in New York. Very fascinating topic to chew over! Remember DJ Renegade at slams at The Fifteen Minute Club in Washington DC. A most unique gentleman who was so obsessed with words that he lived in a homeless shelter and spent his days at the downtown DC Library reading. He later left poetry to pursue a new passion as a professional gambler in Atlantic City. I think the “words on paper” and the “style” overlap but there is no easy answer here, and every artist is so, so different. Just some random jottings. a.) I tried slams for a while, and felt a strange pull to “please” the audience, and bring them more of the whiz bang and the noise. If the “whiz bang” is a natural part of the words, can’t see a problem, but there was something very alluring that I had a strange sense could lead me (given my own personality) astray. The quieter poetry and poets would be lost and drowned out in the beer fumes and body dazzle of a late night slam. b.) I forget the exact context, but E. Ethelbert Miller once gently critiqued a poet as needing to “go back to the woodshed” and apply more rigor to her work. I am unsure of the context, but suspect she was a young poet with a high dazzle quotient in presentation. c.) I memorize all my poems and like to recite to my friends, and haven’t made a lot of effort to print them, beyond a chapbook that I sold in DC before moving on to other life events. But I took the poem below and turned it into a bluegrass song (idea of friend, a musician) which gave it a whole different vibe. But I was happiest when a total stranger to me, from a poetry review far away, found favor with it strictly based on black words on white paper. First, I was fascinated by this read – sensational. Thank you. My thought is that perhaps rather than viewing slam poetry or spoken word as the death of poetry in print (and many actually do), it can be looked at under the lens of revival and revitalization. If you think about students, young ones in particular – are they really fascinated by the poetry that’s published from times considered ancient? Or would they maybe be more engaged by videos of people slamming who are from similar demographics and speak their minds about current and/or resonant issues? I’m sure some would take the former, but my theory is that most fit in the latter category. But spoken word does not have to be all about the stage. It can play a reverse role. The genre, the culture and the movement of spoken word are expanding at an alarming rate. For educators, they can attain written versions of these poems and works of art and study them in a different manner. That allows the mind to wander a bit using individual inflection, intonation, pace and finding relevant and personal meanings. Moe – I also agree with you in a sense. Many perform for the audience. I’m a spoken word artist as well, and all I can say is that I write for myself. Generally, that resonates. But I totally understand what you mean about showboating. Thank you again for sharing this, I enjoyed reading and I loved the poet references, many I had not known of. “Poet voice” of any kind is never good. Thanks, Moe. Old Irish poets. Tunnel vision, much? No, just happen to be poets that I love and value. You may remember that I mentioned DJ Renegade in my initial comment above, who was as far as an “Old Irish Poet” as you can imagine. As a matter of fact, Renegade was open to poets of all stripes, including “old” ones, if they were good. Correction: far FROM an Irish poet. (Not certain if you’re bringing up issues out of a desire for open discourse or an urge to troll… may pass on any more back and forth. I must confess I do hate that one slam poet, the one with a virus for a voice, a style, whose mode of expression has infected so many poets, slammers and all, that they sound just alike. That one slam poet, whose initial performance must have been so affecting the first time, but who I find so painfully grating now coming out of the throats of the viral ridden, that one, who starves me of the authentic voices of the infected. Perform yourselves poets, no one else can do that, and nothing else will feed me. Great Article! Thanks for sharing Jamaal May’s layered work. Just a note of correction. Huge fan of Saul WIlliams and his work. However, Saul is not playing Tupac Shakur on Broadway, but an ex-con named John. The musical is inspired by the songs of Shakur and is non-biographical. I’m also curious where you think group poetry fits in to the discussion. That is those who’s blend of voices strive to form one. Often times a poem will feature two or more perspectives on a single issue and allows for a unique theatricality difficult for a solo performer to employ. I surmise its earliest roots were with the Greek Chorus which we see later in hip-hop to add emphasis to punchlines and achieving a quicker back and forth between voices. Thanks Scott, we’ve made that correction. Slam poetry isnt an end all like its made out to be. Just because its sung doesnt make it art. *cough Your generic pop music. I’m still going to buy print exclusively. In the ’90s I attended a reading at Yale of poets who had gone to school there previously. Mark /strand was the biggest name mentioned. Turns out Mark wouldn’t be there, but Harold Bloom was to read one of his poems. Bloom did so by shouting at the top of his lungs the poem word by word. Oddest thing I’ve ever heard at a ‘reading.’ Couldn’t take in the actual words, let alone how they strung together, because I was just baffled by what was happening. Page or Stage — the origins of the work seem vastly less important than the quality of the results. There are brilliant slammers and brilliant academic types. The method of delivery doesn’t really matter (although the “drone with a slight uptick” is just so true!) It’s like arguing schools — the NY school, Language, Beats, Neo-formalists, Objectivism (hmm, still not sure what that is) and so forth — there’s no one way. Each group produces a couple poems for the ages and then a lot of lesser work modeled on them. And I don’t believe that young poets cannot transcend their own age and demographics and will only appreciate something on U tube or bellowed from a stage. No! This is highly patronizing. Great art feeds across the ages and multiplicity of voices, regardless of delivery systems. It doesn’t lose relevance based on fads or styles or current schools or gender or race or fashion. Poetry has no business being relevant, it just has to be true. P.S Loved this piece and discussion since it forced me to think outside my own demographic choices (page over stage, for sure). What have I been missing? Thank you for nudge!